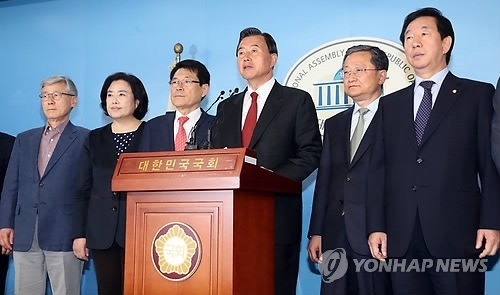 SEOUL, May 2 (Yonhap) -- Thirteen lawmakers announced their departure from the conservative Bareun Party on Tuesday, saying they will support the presidential candidate of a rival party to boost the conservatives' chances in the election seven days away. The lawmakers said they will return to the former ruling Liberty Korea Party and back its nominee Hong Joon-pyo. Bareun, which means "righteous" in Korean, was created earlier this year by 33 lawmakers who had defected from the former ruling party following their support for the parliamentary impeachment of former President Park Geun-hye, who was still a member of the party. "Our nation's politics, economy and national security are currently at a critical and crucial time," Rep. Hong Moon-pyo of the Bareun Party said in a press briefing at the National Assembly, flanked by the other members of the group. "In such a situation, we could not turn away from the expectations of the people calling for a grand conservative merger." 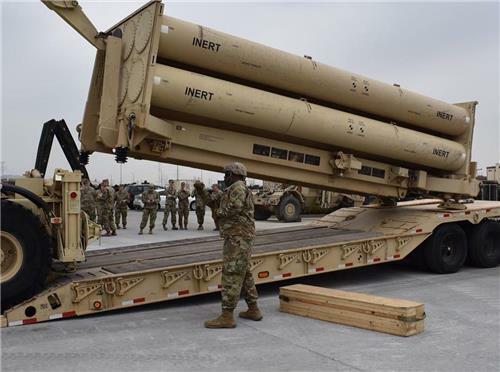 Rep. Hong said there was a "stern" demand by the conservative electorate to unite to stop the "pro-North Korea, leftist" forces from taking power. But despite their efforts to persuade him, the party's presidential candidate Yoo Seong-min rejected their call, he said. "Together with Hong (Joon-pyo), we will do our best to see the conservatives take power," the lawmaker said. The defection of the 13 lawmakers also followed Rep. Lee Eun-jae's return to the former ruling party last week. With their departure, the Bareun Party now controls 19 seats in the 299-seat parliament, while the Liberty Korea Party now has 107 lawmakers, the second largest number after 119 seats held by the liberal Democratic Party. For Yoo, the defection of 13 lawmakers could lead to additional problems in his electioneering as they included all three of the party's lawmakers from South Gyeongsang Province, meaning he may not get the support or assistance he needs while stumping in the region that is considered the home of conservative parties. In addition, seven Bareun Party members of the provincial assembly of South Gyeongsang and 25 members of municipal and district councils in the region also declared their return to the former ruling party. Yoo, who has suffered from dismal approval ratings of around 5 percent, reaffirmed his determination to complete the race alone. "I will make sure I am chosen by the people on May 9," he told reporters on the campaign trail in Seoul. He added, "I wanted to take a truly difficult and tough path together, but I understand why they had to make such a decision. I'm certainly to blame for some of it, and my heart aches over it." Front-runner Moon Jae-in of the Democratic Party commands an approval rating above 40 percent, double that of the closest competitor Ahn Cheol-soo of the center-left People's Party. After struggling for weeks with a single-digit approval rating, Hong has emerged to challenge Ahn with near 20 percent support. The Liberty Korea Party showed mixed reactions to the announcement. "This is an unprecedented event ahead of a presidential election in our nation," Lee Cheol-woo, a campaign official of the party, said. "The water of a sea absorbs all waters at once." Hong Joon-pyo also wrote on his Facebook page, "The people's will has already achieved a unification (of candidacies). (The election) has now turned in our favor." However, some lawmakers close to the ousted president were less than welcoming. "When the Liberty Korea Party suffered all kinds of humiliation and the leftist forces threw stones at us, these are people who sided with them," said Rep. Yoo Ki-June. Meanwhile, liberal parties slammed the Bareun lawmakers for abandoning their party for political gain. "First they joined the ranks of those calling for former President Park Geun-hye's impeachment and said they would build a healthy conservative (force) by creating a new party, and now they are effectively indicating their return to the forces that monopolized state affairs with the presidential election a week away," the Democratic Party said in a statement. The People's Party and the progressive Justice Party made similar accusations. Amid growing uncertainties about the election landscape, Ahn wrote on Facebook that he is determined to win the vote to "stop history from turning back."